The New Galaxy Note 3 is unveiled now and we have already discussed weather to upgrade your Note 2 to the New Note 3. If you are a serious smartphone user then you might want to think of upgrading it or else just move on with the Note 2 or swap it with some other devices. Now we are going to discuss about the technical details of these device and what they can offer us. While looking at the specifications the new Note 3 has many changes added to it. When compared with the Note 2, you will be getting an entire new device on your hand. There are changes from screen size to battery life. Some are major and some are minor but when you add these all up, you will get an entire new device on your hands. 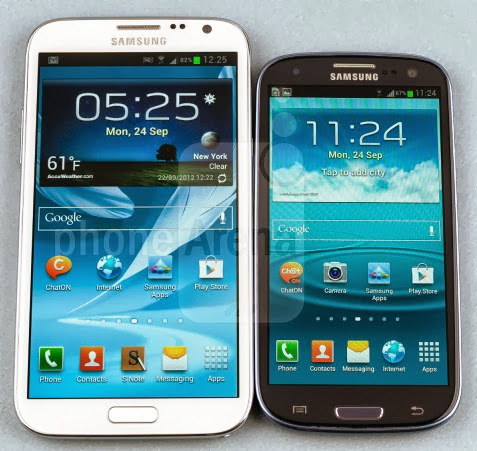 The old Galaxy Note 2 has come up with a 5.5-inch super AMOLED display with a 720p resolution while the new Note 3 is coming with a 5.7-inch Super AMOLED display with a full HD resolution and when compared to the Note 2 it got more pixel density thus the image vibarance. When looking at the design the Note 3 is much more thinner than the previous gen. the Note 2 has came up with a 9.4 mm thickness and the new Note 3 will be coming with 8.4 mm in thickness. The device also got a larger screen compared to the old note 2 so it will look a bit larger, but the comfort level of this device hasn’t changed much. In the terms of processor, the new Note 3 is coming in two variants- the international one is powered by a 1.9 GHz Octa-core chipset, while the LTE variant is powered with a 2.3 GHz Quad Core Processor. And the Note 2, it is powered by a 1.6 GHz Quad Core processor. The complete change in the two devices is its GPU. The Note 3 is powered by an Adreno 330 GPU while the old one got an ARM Mali 400. In the camera section, the Galaxy Note 3 can capture 4K videos at 2160p resolution, while the 1080p videos can be taken at 60fps, while the Note 2 got an 8MP camera and it can capture a good 1080pixels at 30 fps and no more than that. The new Note 3 will be coming out with 9 different colour back panels but in the Note 2, it came with only three back panels blue, grey and white.